Digging around the booths at the 2012 Sea Otter Classic, we uncovered a few new cyclocross tires and some tire news. 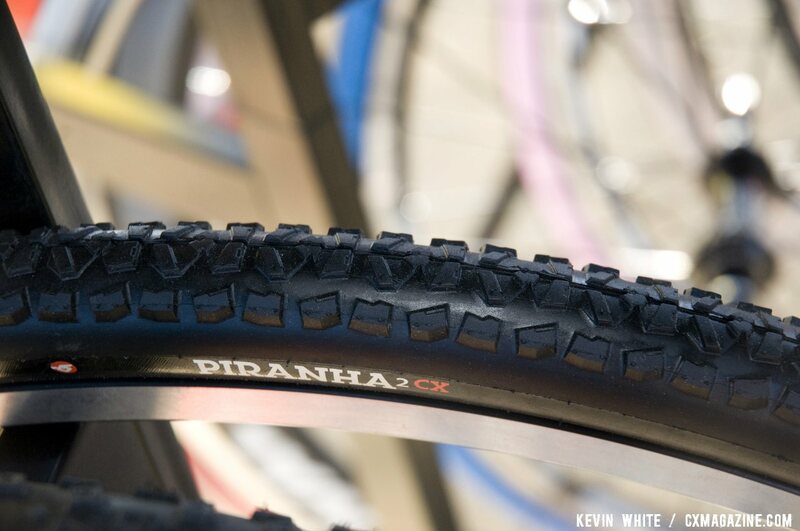 It takes a bit of detective work to find new cyclocross tires at Sea Otter, but given that it’s the one bike component that’s purely cyclocross-specific, new tires are a high priority item for us to find at the Sea Otter Classic. 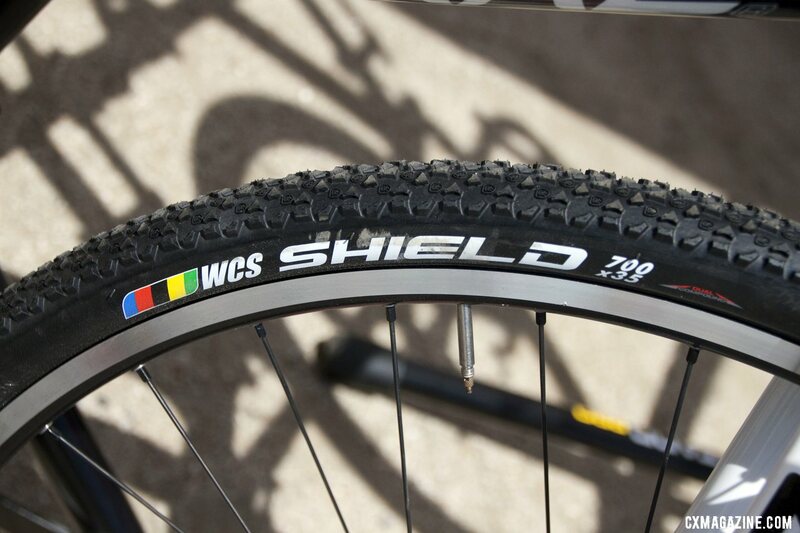 Although Ritchey Logic skipped this year’s 2012 Sea Otter Classic, sitting on a Lapierre aluminum cyclocross bike was the new Ritchey 700×35 Shield WCS cyclocross clincher tire. 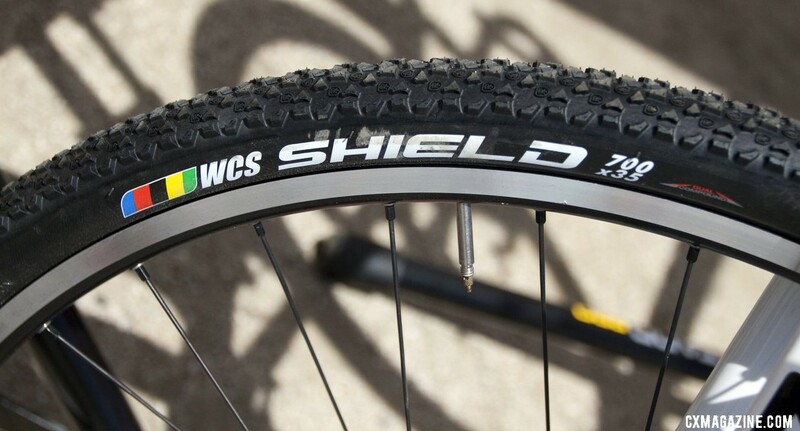 Like the company’s Shield mountain bike tires, the cyclocross version of the Shield features a number of relatively closely-spaced knobs, with shorter center knobs and taller side knobs. 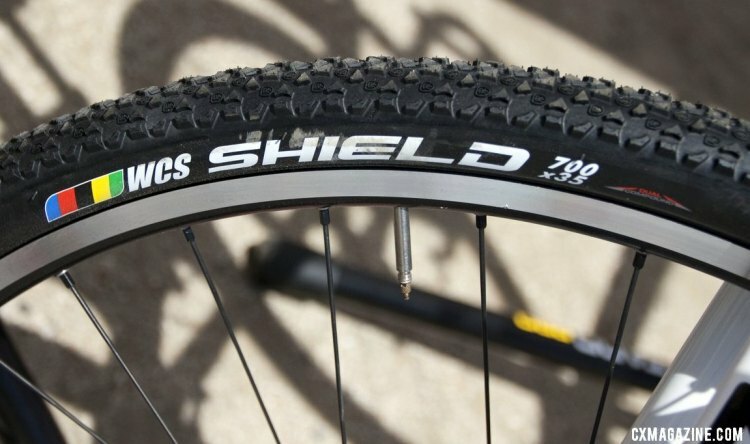 It looks like a fast-rolling tire ideal for hard pack, and Ritchey describes the tread as a “low-profile tread pattern [that] provides perfect all-round qualities with incredible traction and control.” The WCS version offers a dual compound rubber tread, with a harder center section for better durability and lower rolling resistance and softer shoulder knobs for better grip in cornering. 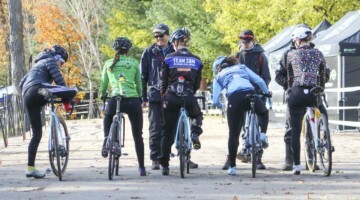 It’s really nice to see Ritchey buck the trend of adhering to UCI width regulations even with clincher tires, and instead release a high volume cyclocross clincher, since the vast majority of clincher racers are not racing UCI events. 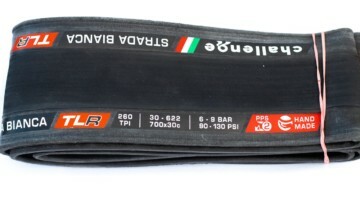 We’re confident the higher volume tires, because they allow a racer to use lower pressures without pinch flatting, will make most clincher racers faster, and it’s clear that Ritchey understands that. Unfortunately, Hutchinson went the opposite direction, and was worried about the UCI regulations even for their cyclocross clinchers and pulled the plug on the high volume 700x34c Road Tubeless-ready Bulldog and Piranha. 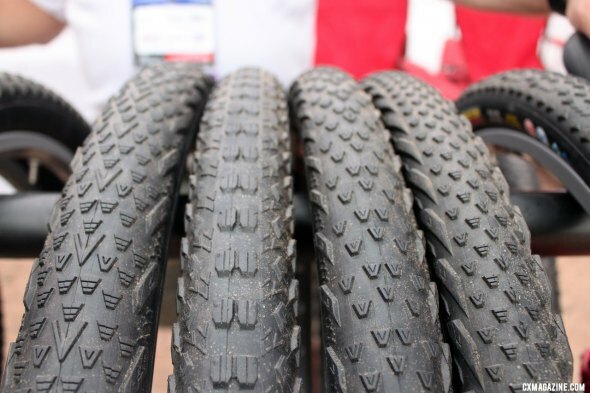 The company now offers the black 700×32 Toro and Piranha 2 tires that we first saw at Eurobike. When we spoke to the company a few months ago, they said they are still committed to tubeless in cyclocross and have plenty of the silver 700x34c tubeless tires still available, but if you’ve had as much luck running the carbon-bead version tubeless as we have, you better stock up now. The good news is that Hutchinson is now making 32c cyclocross tubulars for the UCI racers, so theoretically you could train on the clinchers and race on the tubulars, and be comfortable with the same width and tread. 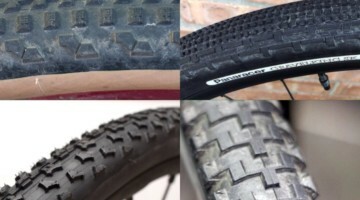 Hutchinson has plenty of experience with tubulars, as the French company has long made all the rubber treads for Dugast, and with such a partnership in place, we’re excited to try their new tubulars. 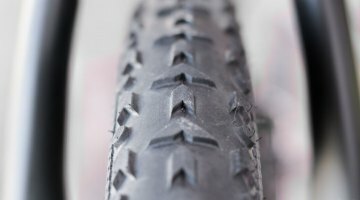 Continental has shown off cyclocross tubulars for several years, but has never been able to do a full production run due to some production challenges related to outsourcing the project to another tire company. 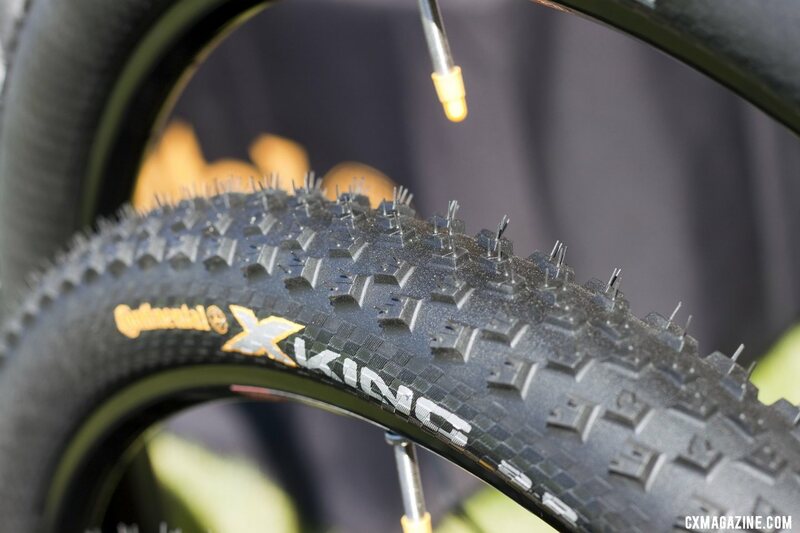 Continental’s Brett Hahn has told us they’ve solved those issues and will be making their own cyclocross tubulars now, and has assured us that they’ll be ready for this season. 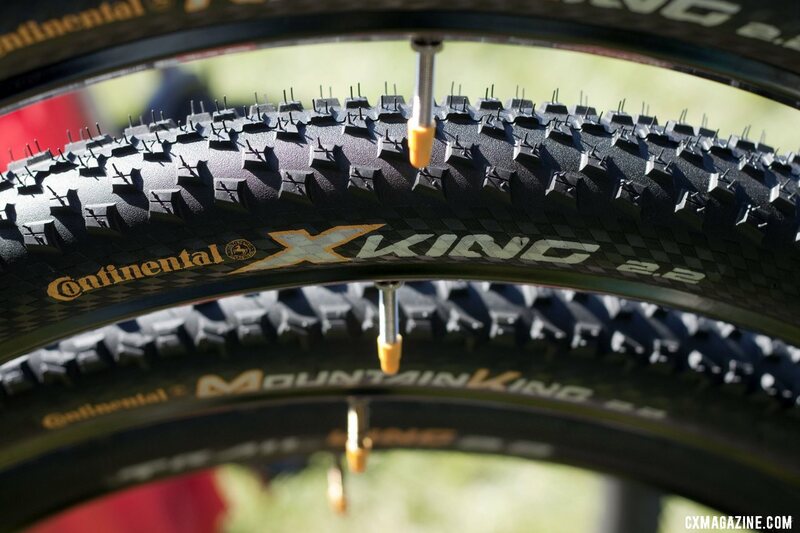 The first model will be a relatively aggressive tread based on the company’s X-King mountain bike tire, and may be a good all-around and muddy conditions tire. Stay tuned as we will be testing a set. 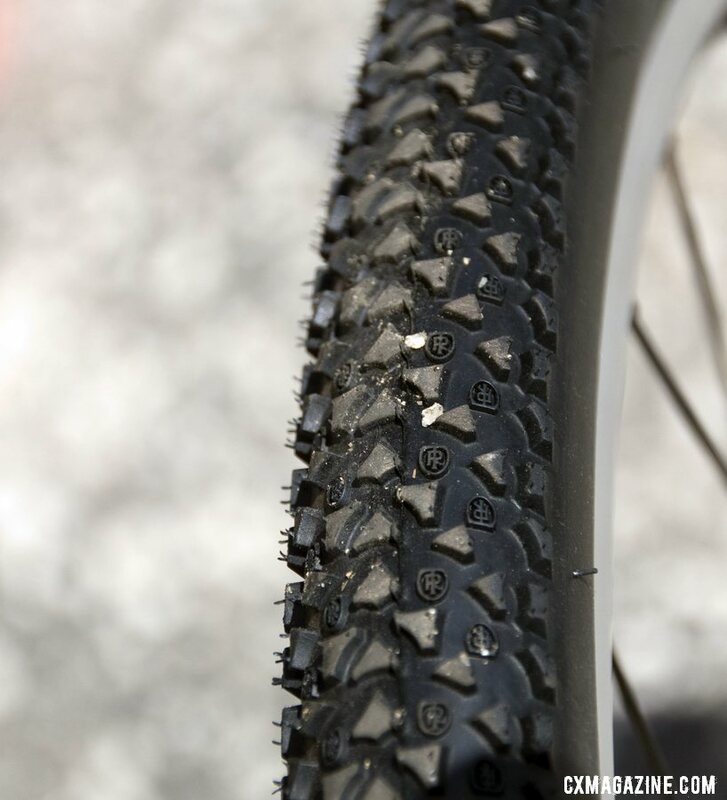 A preview of the tread on Continental’s new 2013 cyclocross tubular. 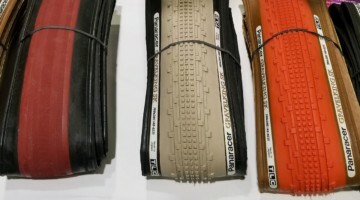 Vee Rubber has an impressive selection of mountain bike treads, and most will be available in a 700c size for cyclocross. 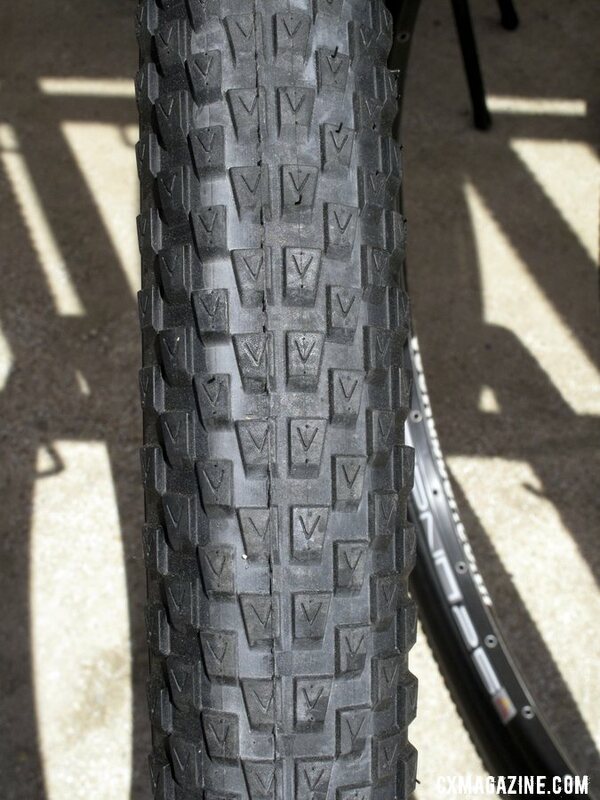 We grabbed a first look at Interbike 2011 of these tread patterns, and got to see some of these treads in 700c sizes at Sea Otter 2012. They’re named after combustion engine configurations, as in a V8 engine, and they’re easy to differentiate and name by just counting the number of knobs across the width of the tire. We took a look at the V7, V8, V10, V12 and Flying V treads. All look to be relatively fast rolling treads for hard pack or mixed conditions. 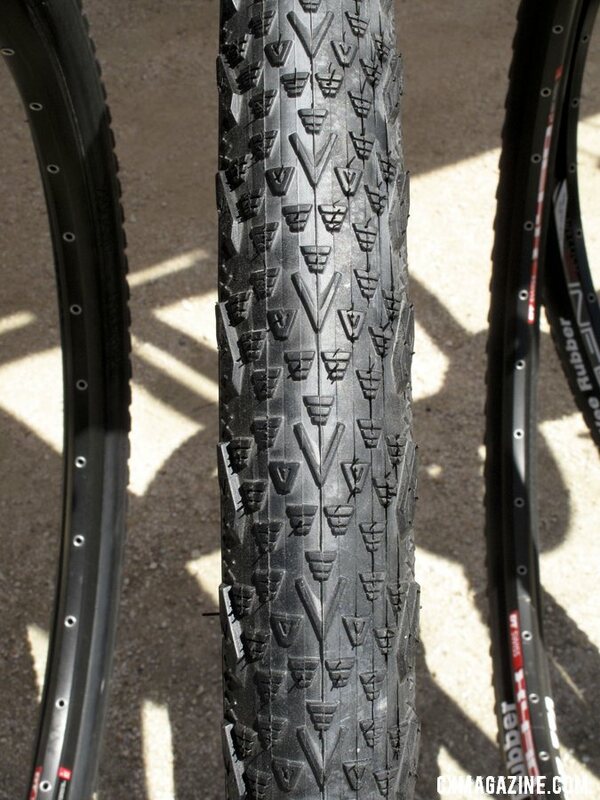 Some of these tires will be available in a generous 40c width. The one tire missing from the company’s diverse 700c tread selection? A clear mud tire. We’re guessing that’s not far away. View all the new 2013 cyclocross gear in our ever-growing Sea Otter 2012 coverage. 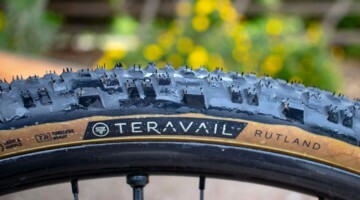 Liking the tread for fast gravel and dirt! 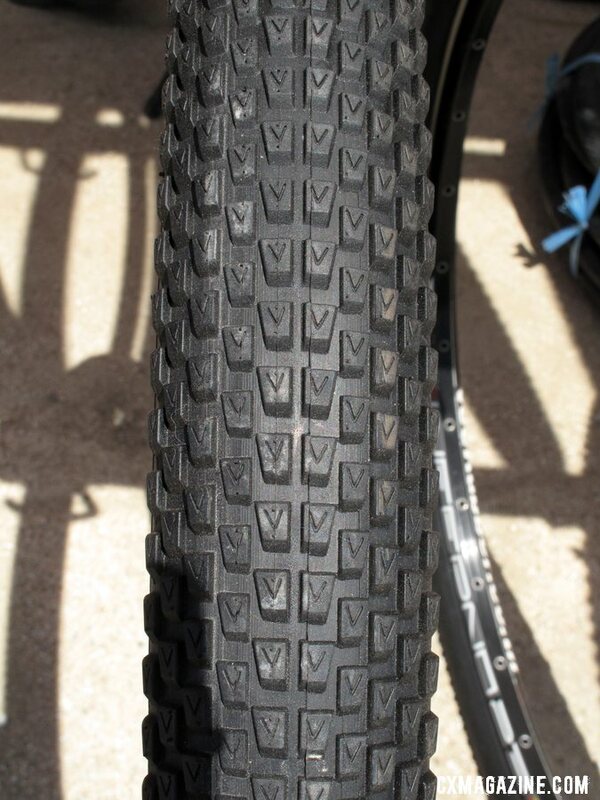 I’ve been racing on the Vee Tire Flying V…great tires. Isn’t that guy supposed to be John Tomac? We’ll politely disagree that that applies to everyone. At the World Cup level perhaps, but Stans NoTubes is racing well at UCI races. For many amateurs, the convenience, cost and ability to avoid pinch flats and punctures makes it well worth it for race day too, especially if you don’t have a pit bike and crew! Johan Van de Ven Arno van den Berg mooi bandje nie! !